Hey LJ’s,,Been contemplating the purchase of a more powerful planer. Been looking at Grizzly’s 15 inch series including the bare bones model. Looking at the web site last night I noticed that the 15 inch planers were not in stock but I could place an order. Whoa! Uncle Donald ’s tariffs are alive and well! 275 dollars ! It means I have to build a movable cart that will hold it and allow me to maneuver it outside or attached to my newly installed 220 3 hp dust collection which I have been posting progress on Instagram. As always comments, are welcome. Just got an email it’s been shipped. Congrats Tom I hope it does the job for you. 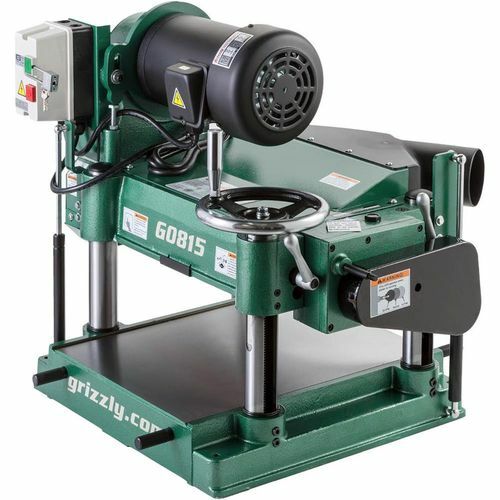 A great choice Tom…I have had a Grizzly 15” planer for 10+ years and it is a workhorse. Have you looked into the cost of adding carbide cutters in the future? I personally think carbide cutters are the best thing since Louisiana Gumbo and worth every penny. Whoa! That’s a nice machine, Tom! Congrats my friend. Probably would have waited a while longer. Other priorities, but my plan has been to use what mother nature and God provide. In the movie “Evan Almighty,” God ( Morgan Freeman) says ” People pray for things all the time, I just give them the opportunity to make it happen. With opportunities come other problems to solve? Like the walnut tree laying in my yard, which I have to mill myself. And I now have to build a solar kiln to kill powder post beetles in the rough sawn maple I purchased last fall. Also met with the wood sculptor in Mankato 2 time now. I now have a lot of potential material, I say potential because I can’t seem to get past that. Murphy keeps throwing things I need to handle before that happens? I wanted a bit more but this guy should meet my current needs, and I can’t afford to spend any more on tools. Until woodworking starts making some money? Going to rain next 5 days re: weather bug. So much for chemical treating the wood. I will just have to put one foot in front of the other. Maybe I missed what you’re going to treat the wood with, but be careful what you use because some chemicals off fume for a long time and anything you make may smell for a long time making your product unsellable to someone sensitive to odor like my wife and me. That should work Tom,I had a customer use Borax on some mold on a large area and there was no smell that I could detect. That sounds like a winning mixture. Good move on purchasing the planer Tom. I had the opportunity to use that model years back. It was a great machine. The only problem was, it wasn’t mine. Now I have to build a mobile base that will allow me to move the 410 pond bear in and out of my shop. Ordered 4 inch casters, hope that’s enough.